Ormond Beach, Florida police finally caught up with two women suspected in a rash of robberies dating back to December 2016, according to a recent WFLA NBC News Channel 8 report. Officials had been on the lookout for perpetrators wearing a Batman mask and using a knife to threaten employees at Volusia County retail businesses. The women were apprehended when authorities discovered them sleeping in a car at an area shopping center. The pair have been charged with multiple crimes, including grand theft, trespassing, and robbery with a deadly weapon, among other counts. After their arrest, the two women were booked and were being held without bond. Authorities may hold individuals without bond when they’re accused of certain crimes, so it’s important to understand how Florida criminal law works in these cases. Both the Eighth Amendment to the US Constitution and Florida law give you the right to post bond when you are arrested for committing a crime. Under a bond arrangement, you deposit funds with the court in exchange for remaining free between your arrest and a full trial in your case. 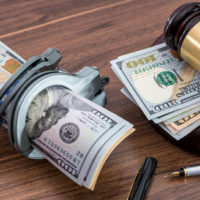 The purpose of bond is to give you a financial incentive to show up in court for subsequent proceedings: You don’t get the money back if you fail to appear. Your bond is set at your initial appearance before a criminal court. A judge will first determine whether bond is proper in your case, and then move to set the bond amount. He or she will look at different factors in determining bond, such as the possible risk to the public if you’re set free until your trial; the judge will also assess whether you may post a flight risk. At this hearing, you may be released on your own recognizance and not be required to deposit money with the court. If the judge orders you to be released on bail, you will have to post bond in cash or in the form of a surety bond. Under certain circumstances, a judge may order that you be held in jail without bond as you await trial. Crimes for which there is no bond allowed include capital offenses or charges that may result in life imprisonment if you’re convicted. Still, the evidence must show a high probability that you are guilty of the crime or a strong presumption that you will be convicted at trial. You may be denied bond when arrested for certain crimes in Florida, so it’s important to work with a qualified attorney if you’ve been charged with one of the non-bondable offenses under state law. Kevin J. Kulik is an experienced lawyer who will fight for your constitutional rights and defend your interests against aggressive prosecuting attorneys. For more information on bond matters in criminal cases, please contact our Fort Lauderdale office. We can schedule a confidential consultation to discuss your options in more detail.